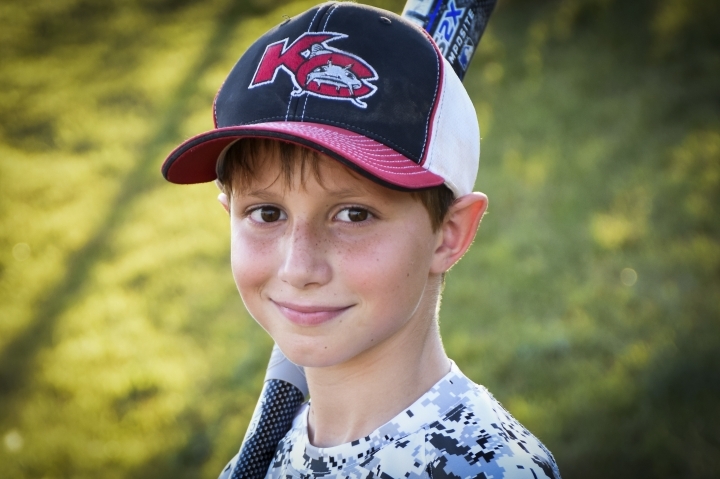 KANSAS CITY, Kan. — The 10-year-old boy killed during a ride on the world's tallest waterslide was decapitated in the accident, a person familiar with the investigation said Wednesday. Authorities have yet to explain how it happened. 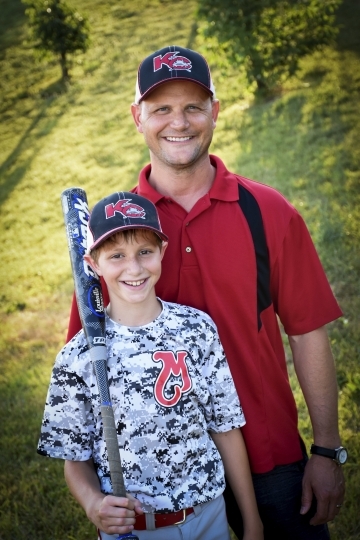 The person was speaking on condition of anonymity because the person was not authorized to speak publicly about the death of Caleb Schwab Sunday on the "Verruckt" raft ride at the Schlitterbahn WaterPark in Kansas City, Kansas. Two women who are not family members were also in the raft at the time and were treated for facial injuries. 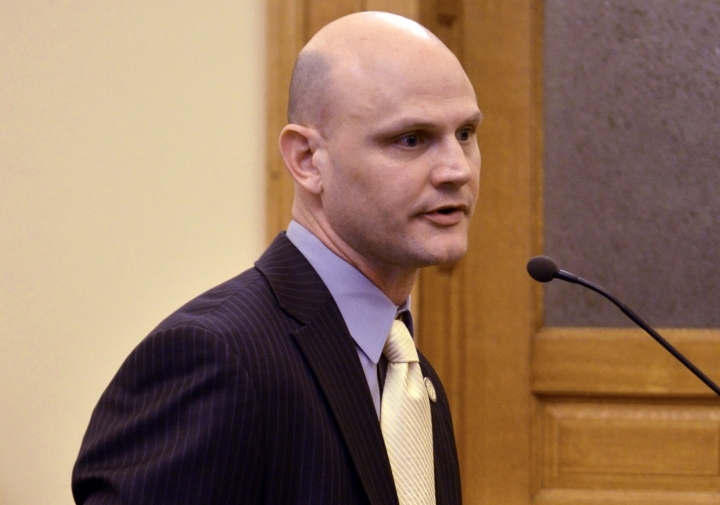 The boy's parents — Republican state Rep. Scott Schwab and his wife, Michele — have not spoken publicly since the death. His funeral is scheduled for Friday. 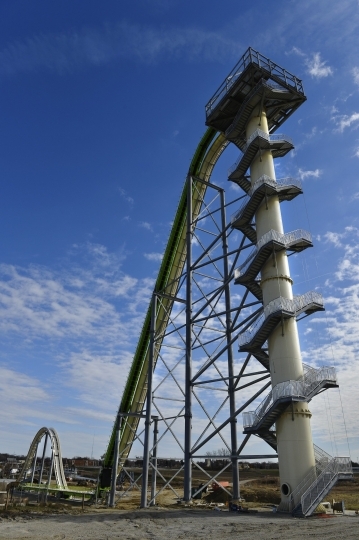 Verruckt —which in German means "insane" — featured multi-person rafts that make a 168-foot drop at speeds of up to 70 mph, followed by a surge up a hump and a 50-foot descent to a finishing pool. Since the accident, investigators have removed netting that was held in place by supports above the 50-foot section from the hump to the finishing pool. Riders, who must be at least 54 inches tall, were harnessed with two nylon seatbelt-like straps — one that crossed the rider's lap, the other stretching diagonally like a car shoulder seatbelt. Each strap was held in place by long Velcro-style straps, not by buckles. Riders would hold ropes inside the raft. The park reopened Wednesday except for a large section that includes the waterslide, although its towering profile greeted visitors when they drove through the entrance. Access to the Verruckt was blocked by a 7-foot-high wooden fence. On a hot, midweek day, the park was doing a steady business although there were no lines for other rides. Schlitterbahn spokeswoman Winter Prosapio told The Associated Press outside the park's entrance Wednesday that the company was not discussing Sunday's tragedy out of respect for the family. She also said that she could not offer immediate perspective about how Wednesday's turnout compared with typical attendance. "We didn't know if we'd get five people, 15 people. But this is affirming," she said. Pulling a cooler behind her, 42-year-old Sara Craig said she was a bit uneasy bringing her 14-year-old son, Cale, and one of his 13-year-old friends to the park Wednesday. "I feel guilty having fun when a family is hurting so badly," she said. She said the family rode Verruckt twice in one day a couple of weeks ago. She remembered a short video they were required to watch, though she didn't recall that it included any caveats about peril. Craig said that during her first trip down the ride with her son and one of his friends, her shoulder restraint came off, something she opted not to report to park workers. "I didn't think much about it," she said. "You don't think you're gonna die." So they rode it again, only to see the restraint on her son's friend also come loose by the time it was over. She said the ride's operators sent them down the slide even though their combined weight was 393 pounds — shy of the 400 weight minimum the park advertises as a requirement. Craig described the ride as "very, very rough," so much so that "when I got off, my head hurt." 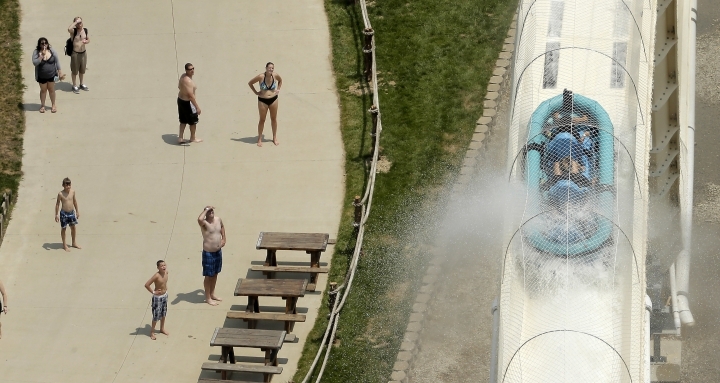 The water park passed a private inspection in June that included Verruckt, according to a document released by a Kansas state agency. The Kansas Department of Labor provided to The Associated Press on Wednesday a copy of an insurance company inspector's June 7 letter saying inspections had been completed. The letter said all rides met guidelines for being insured with "no disqualifying conditions noted." But it added: "this survey reflects the conditions observed or found at the time of the inspection only, and does not certify safety or integrity of the rides and attractions, physical operations or management practices at any time in the future." The inspector declined to comment on the incident at Schlitterbahn. Kansas law requires rides to be inspected annually by the parks, and the state randomly audits the records. The last records audit for Schlitterbahn was June 2012. Associated Press writers Bill Draper and Margaret Stafford in Kansas City and John Hanna in Topeka contributed to this report.